Entrepreneurship is a risky endeavor. While many tend to romanticize the stratospheric success of famous entrepreneurs like Bezos and Zuckerberg, creating an enterprise from scratch and gaining traction is no easy feat. Empirical data also indicate difficulty in creating successful companies, as 9 out of 10 companies go belly-up within 5 years of existence. Considering the difficulty in starting and sustaining a venture, and low risk appetite, many are forced to set aside their cherished dreams of becoming their own boss. Despite the apparent merits of entrepreneurship, it should not be considered a panacea for all career uncertainties. Individuals have varying preferences and purposes in life, and should aim to align market needs with the individual’s expertise and passion. However, having an entrepreneurial mindset many prove beneficial in making critical career and life decisions, amid the turbulent and fast changing world. The global economy is undergoing a digital transformation over the last decade or so, especially in the world of Internet of Things (IoT), artificial intelligence and data analytics. These disruptive forces of technology have upended traditional industries making many skillsets redundant, like those in the global print media industry, where freely available content have disrupted the advertising based business model for newspapers. Mainstream television channels have suffered loss of ‘eye-balls’ due to the ‘second screen’ revolution, driven by smartphones and media platforms like Netflix. Amazon and other dominant e-commerce players are making window shopping a thing of the past, spelling doom for the retail industry. Supercomputers may at least partially displace traditionally safe jobs like that of lawyers and doctors. Developing countries are not even immune from this technology wave, where labor intensive blue collar jobs are slowly getting automated, leading to job losses. How can someone weave his career during times like this? What are the ways to find the ‘true calling’ and make necessary career shifts during times of upheaval? How do you build core competencies for sustaining a successful career? A note of caution- I’m not a career counselor and don’t claim to have concrete answers to the above. But, I can share some tools which can probably help someone make better life and career decisions. Gone are the days of ‘one career- one job’ philosophy. Due to technological shifts, many companies and industries would cease to exist within the next couple of decades. Many traditional businesses are more concerned about their survival than even before, and would do anything necessary (including making lay-offs) to cut costs and survive. It is our responsibility for looking after our career. According to Reid Hoffman, founder of Linkedin, we’re all CEOs of a startup called ‘You’. Like any startup, we should define our value propositions, find ways to build core competencies, promote our brand, monetize our knowledge and skillsets and pivot due to changing business environment. Over the last decade, the passion theory has been getting a lot of traction, especially after Steve Jobs popularized the concept during his Stanford commencement Speech. The theory states that, in order to be successful, someone has to be passionate about whatever he/she is doing. While having passion is a key contributor to success, other factors are equally important. 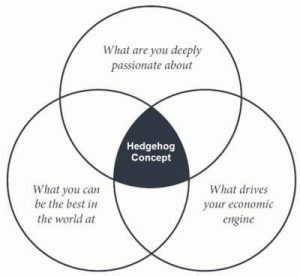 The Hedgehog principal can possibly provide a well-rounded tool for deciphering our unique career value proposition. According to Jim Collin, a renowned management guru (author of Good to Great- a must read), success for any company or individual comes at the confluence of passion, expertise and market needs. It’s a matter of introspection and trial and error, to better understand our inherent abilities and passion. Alongside, some research and discussion with experts would help gauge the market prospects for a particular career stream. This tool will not only be useful for fresh graduates, but would provide important directions for those at the cross-roads of their career. While stating that ‘specialization is bad’ is going too far, having multiple skillsets will provide leg-up over others in the long run. 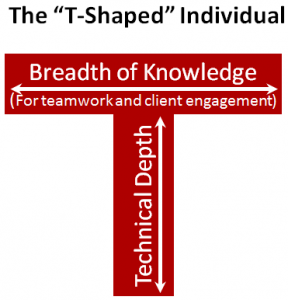 According to the T-shaped expertise model, professional should strive to have a strong suite, an area of expertise. But one must have some parallel skillsets to complement his core expertise. For example, an accounting professional with deep expertise in accounting software is directly useful, but intermediate level understanding of popular programming languages can potentially be a big plus. Any professional or fresh graduate must allocate time for self- development, which would help enhance knowledge and develop relevant but not necessarily identical skillsets. Determining value proposition and building expertise is key to a successful career. However, without proper communication to the target audience, all efforts would be futile. Just like how an entrepreneur needs to maximize exposure for his company and product portfolio, an individual must find ways to promote and position his personal brand. The idea is to communicate why we exist and what value we’re adding for the society, with the view to solving some problem. Anyone can use different tools for projecting their brands, starting from engaging in speaking engagements, to creating relevant content and to attending networking sessions. In this fast changing world, we need to find ways to remain relevant. At times, our careers may hit the figurative glass ceiling or the brick wall, which would warrant a rethinking of career goals. Disruptive changes may require someone to totally leave the industry. The idea would be to build an array of skillsets which can form the bed rock for our professional competitive advantage and remain relevant across different industries. Nowadays, careers take us to multiple industries. Professionals starting career in FMCG may not end up staying there for long, possibly moving to other industries. For example, Sheryl Sandberg, COO of Facebook, started off at the World Bank, then moved on to Mckinsey, a top management consulting firm, then joined the US government in the Treasury Department. She subsequently moved to Google as a department head, finally ending up at Facebook as its COO. We need to build the requisite knowledge and skills to survive and sustain in multiple industries in varying roles. Our self-development goal should entail gaining expertise in multiple areas which can become relevant for jobs in different industries. Since time immemorial, humans have been facing adversities and had to change and adopt to survive. Our hunter gatherer forefathers had to adopt to the environment to survive on a daily basis. As the human civilization advanced into an agrarian society, each farmer assumed the role of a multitasking entrepreneur. Industrialization has gradually turned us into a specialist cog within the economic machine. We need to bring forth our natural instinct and utilize our entrepreneurial mindset in building a career and life.